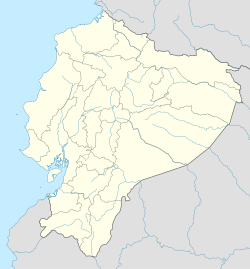 Puerto Francisco de Orellana (Spanish pronunciation: [ˈpweɾto fɾanˈsisko ðe oɾeˈʝana]), also known as El Coca (pronounced [el ˈkoka]), is the capital of province of Orellana in eastern Ecuador. The city is located in the Amazon Rainforest at the confluence of the Coca River and the Napo River (the smaller Payamino River also merges into the Napo in the city). It has a population of 45,163 inhabitants as of 2010. It is visited by tourists going into the Amazonian forest and is served by the Francisco de Orellana Airport. The city is named for Francisco de Orellana, who explored the confluence of the Coca River and the Napo River. It is believed that he set sail from the current location of the town eventually making his way into the Amazon River seeing the "Amazon" or tribes in which the women also fought. Eventually Francisco de Orellana made it to the Atlantic. He made a second expedition leaving but died on the Amazon delta unable to find a way through. ^ Puerto Francisco de Orellana, Orellana, Ecuador at GEOnet Names Server. Retrieved 7 November 2009. This page was last edited on 20 March 2018, at 08:18 (UTC).